Having Alison Daykin as a teacher might have steered me in the direction of art yarn, but I find that the yarns I like making most are thin, smooth and even. Despite this I find Lexi Boeger's work outstanding. A while ago I featured a selection of her photographs in my newsletter. The first section of the book covers preparation and carding of your raw fibre and contents of your 'treasure box'. The techniques follow. I was expecting the usual: thick/thin, slubby, core and coil, but this is a big book and the techniques go on and on with techniques and many variations that you may not have seen before. I think of art yarn as yarn which looks beautiful as yarn. 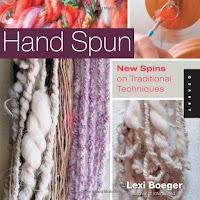 The term 'art yarn' is used in the book, but far from wanting you to make yarn that you only admire in it's own right, Lexi intends that you use what you make. she proposes keeping the stitching very simple, allowing the yarn to speak for itself. The twenty projects - yes twenty - include a fly-fishing dry-fly. That may be a first! I have to be honest and say that while I find almost all of the pictures of the yarn really appealing, only a few of the projects grab me. 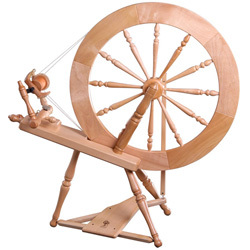 However, it goes beyond knit & crochet and they serve to demonstrate some imaginative ways to use your yarn. In addition to all of this, the book has an enjoyable introduction from Owen Poad of Majacraft, a gallery, some profiles / interviews with artists and Lexi's tips. The jacket says that this is a 'well rounded' book and it certainly is. Nicely-designed, well-illustrated with sufficient and accessible text. it covers the subject very well, from preparation through to finished projects. I was doubtful about whether to order this book but when it arrived, I was immediately drawn in and although I didn't have the time to sit down and read it properly straight away, I couldn't walk past it without picking it up and flicking through it. Check out pluckyfluff online http://www.pluckyfluff.com/yarn.html to see what Lexi does and if you like those images, then you'll love this book. Yvonne the sheep - a web cartoon.